You feel it the moment you walk in. Something different. It’s more than vibrant colors chosen to inspire kids. More than a curriculum crafted to not only teach kids to swim but also to build their character. More than a shiver-free pool heated to 90 degrees. There’s something more. Something that propels Goldfish Swim School beyond typical. It’s passion. Not just a passion for kids or for swimming…it’s a special passion for changing – even saving – lives by teaching kids to swim. A passion born in the heart of a mom – driven by her love for children, swimming and a desire to deliver an unmatched “Golden Experience”. Classes range from introductory parent-tot programs to advanced pro-level lessons. We also offer a recreational swim team for those swimmers that want to swim for an hour and prepare for the next stages of competitive swimming. Lastly, we offer weekend birthday parties and open swim times. 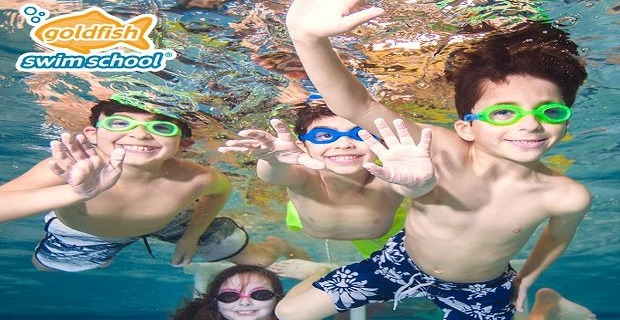 Goldfish Swim School is the perfect solution for parents looking for quality swim lessons in the Bergen County area. Located in Wyckoff in Boulder Run Shopping Center there is ample parking and easy access from Route 208. Please visit our Facebook page at www.facebook.com/goldfishwyckoff off the latest updates or our website www.goldfishswimschool.